Thank you to our Principal Sponsor, McLaren. Our Guardian Society is made up of dedicated and compassionate individuals and families who strongly believe in our mission of service to our community. By making a five year pledge commitment to St. Vincent Catholic Charities, our Guardian Society members embrace the importance of long-term sustainable funding. Their investment enables us to forecast available resources five years into the future. 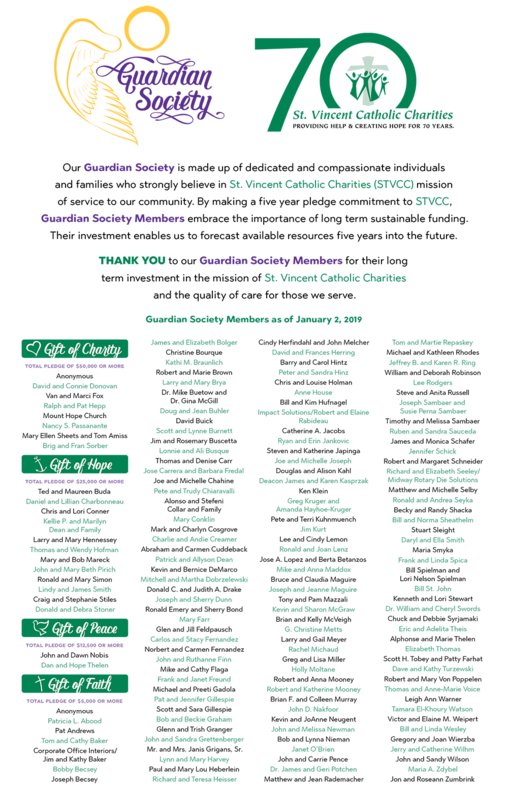 A special thank you to our Guardian Society Members for their long-term investment in the mission of St. Vincent Catholic Charities and a superior quality of care for those we serve. To join the Guardian Society, please complete the attached form. Once complete, please email the form to the Development Team.